Good health should not be taken for granted when trying to create a strong, prosperous community, according to the team at Genesis Health System based in Davenport, Iowa. Leveraging their expertise and resources to enrich the lives of people in the Quad Cities and surrounding areas, the Genesis team has more than a handful of programs that addresses the specific needs of the community from aiming to make the area flu-free to helping residents navigate the new programs available through the Affordable Care Act. To learn how the company is supporting its community and how it decides which initiatives to pursue, we chatted with Kenneth Croken, vice president of corporate communications & advocacy for Genesis Health System. Your company partnered with the Quad Cities Health Initiative to identify critical health needs for the Eastern Iowa and Western Illinois. How did that come about, and what did Genesis do with the findings? It’s rather unique and indeed was recognized by American Hospital Association with a Nova Award a few years back, which doesn’t happen all that often. The two competing health systems in the area got together with other community health leaders about 15 years ago and formed the Quad Cities Health Initiative (QCHI) to address community health needs in a collaborative and cooperative fashion. Every three to five years, we take the community health needs assessment from QCHI and studies we do (because we also operate outside of Quad Cities area) and develop an implementation plan. We then carry it to board to get approval before executing it. To communicate what we plan to do, we keep an online yearbook, an abbreviated version of the plan and what we’re doing about it to answer the goals. A plan is lovely but it’s execution that matters. Tell me more about the Genesis Flu-Free Quad Cities initiative. What started as a pilot program that vaccinated 400 students in 2007 is now helping close to 10,000 children per year. Why did the company decide to expand the effort and how was it able to do so? 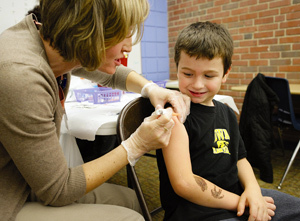 It’s a successful program because it makes flu shots available in schools, which is a wonderful thing for all families. Even those that can afford it or would be inclined to take their child to a doctor, this makes it more convenient. Sometimes convenience goes beyond traditional convenience. The accessibility provided by a school-based program is convenient for some families. For those with limited resources, it’s the difference between getting and not getting a flu shot. From a health perspective, it’s critically important to a community to strive for herd immunity from flu. When flu comes to your community, it generally lives in your schools. Kids will carry it home to grandpa or baby sister for whom it could be a life-threatening event. Flue-Free QC has resulted in great success in terms of our incidences of flu. It’s also important to the students because the flu will be two really bad weeks of poor health but it can also have lasting consequences. Missing two weeks of school can make it hard for students to catch up. Plus, there’s the economic impact on the whole community when adults miss work because they have the flu themselves or someone at home with the flu needs a caregiver. We studied our impact for several years. Not that there was all that much debate, but we did see significant increase in school attendance rates in schools participating in Flu-Free QC. Then we also tracked the incidence of emergency room visits for flu community-wide. We’ve had mild flu seasons recently in our region and would attribute at least a portion of that trend to the Flu-Free program. The Affordable Care Act has changed the healthcare landscape. What has Genesis Health done to ease the transition for the public? As an organization, I believe Genesis has been a national leader in embracing the population health dictates of the ACA. We have accelerated our deployment of our ACA prescribed medical homes using health coaches and system navigators. We’re also working to address the primary and chronic care of this community in a way that minimizes residents’ need for the more expensive emergency and acute care that has historically been the focal point of the health care system. One of Genesis’ latest community contributions is the $50,000 primary sponsorship of the Quad Cities Food Hub Veggie Mobile that debuted this summer. Tell me more about it and its mission. That’s a brand new initiative. As you can imagine, Iowa offers a wide variety of nutritious affordable locally produced food, so we are indeed blessed. While there are many local and comprehensive farmers markets, what we don’t offer is available public transportation. Much of urban Iowa has only limited public transportation. For many people, getting to local famers market or even grocery store can be challenging and expensive. So what we’ve done, working with Food Hub and the Wellmark Foundation, is established an extension of the food market that transport locally grown, highly nutritious vegetables to neighborhoods that are underserved. What’s your favorite community initiative and why? I have to love Flu-Free QC because it was my baby; it’s one of my children. I’m also very proud the way the community has embraced it. Our local minor league baseball team, the River Bandits, has programs set up to donate a percentage of sales to Flu-Free QC and other children’s initiatives. We also have the support of the local hockey team. Beyond that, every year we get checks in the mail that say, “Please make sure every third grader at my old elementary school gets flu shoots this year.” It’s not just me who loves the program.